If you want a post-workout supplement which can make a difference and has a catchy name to boot, you may want to size up SizeSlim Recovery. This review will give you the lowdown on this up-and-coming player in the bodybuilding supplement industry. Sweetened with stevia. Helps regulate blood pressure and blood sugar levels. Tremendous source of Vitamin C. Whopping 1,111 percent of the daily value. Has HICA amino acid. Helps reduce acid buildup, increase endurance, and ward off delayed onset muscle soreness (DOMS). Other Ingredients: Natural Flavors, Silicon Dioxide, Calcium Silicate, Malic Acid, Gum Blend (Cellulose, Xanthan, Carrageenan), Citric Acid, Stevia Leaf Powder, Beta Carotene (for color), Monk Fruit. Training Days – Mix 1-2 scoops with 12-16 ounces of cold water or your favorite sports drink and begin sipping mid-workout. Non-Training Days – Can be used any time throughout the day to enhance muscle recovery. Honestly, we’ve had it with bodybuilding post-workout supplements laced with junk and artificial sweeteners. Whenever a post-workout aces our standards but falters in the end because of the inclusion of say, Splenda, it gnaws at our conscience. The UK’s Bulk Powders AFTERMATH is a prime example. You should see several similar products in our B5 post-workout review section. We hope that trend stops. On the flip side, when do we see more post-workout supplements sweetened with stevia? This is a natural, plant-based sweetener which helps regulate blood pressure and blood sugar levels. Enter SizeSlim Recovery, a post-workout which has this special ingredient. This product “is a supplement used to help add strength and muscle and reduce soreness after working out,” per the manufacturer’s webpage. We like that. Putting on muscle mass, warding off soreness, and shortening recovery time are some of the main post-workout goals the regular bodybuilding enthusiast tries to achieve. Struggling with your post-workout goals? Maybe SizeSlim Recovery can help. Leading the charge are four grams of branch-chained amino acids (BCAAs) on a 5:1:1 ratio per 10.5-gram serving. Based on our computation, that’s around three grams of leucine, 500 milligrams of isoleucine, and 500 milligrams of valine per serving. The manufacturer correctly points out leucine has “the largest effect on muscle building as it activates the pathway for protein synthesis.” Moreover, “Exercise highlights the importance of the BCAA leucine in the regulation of muscle protein synthesis,” per the Journal of Nutrition’s February 1, 2006 issue. We think the amount of leucine is decent. It’s not optimal (some post-workouts have a whopping five grams of leucine per serving), but it should be just enough to help you gain some lean muscle mass. Recent scientific evidence also suggests leucine helps preserve muscle mass and torch fat. This BCAA helps you lose weight by triggering the release of an appetite- suppressing hormone from the hypothalamus. Ergo, leucine helps you muscle up and lean out. The three grams of leucine per serving in SizeSlim Recovery should help, but you’ll get better results if you take it in conjunction with sound nutrition, regular exercise, and ample rest. On the other hand, we’re not so gung-ho on the amounts of isoleucine and valine in this product – 500 milligrams per serving is okay, but more would have been better. Isoleucine is the BCAA which helps maintain a positive protein and nitrogen balance for more muscle growth. As you can see, it complements leucine perfectly. As for valine, it helps repair muscle tissue, increase endurance, and regulate the immune system – all important post-workout benefits. Many post-workouts have one gram of each BCAA. If you supplement with SizeSlim recovery, you’ll get that much if you consume two scoops after a tough workout. That’s the downside: you’ll get the optimal amount of isoleucine and valine if you use up more servings. In addition, “glutamine helps to recover faster from intense training allowing you to push longer and train harder,” per the manufacturer’s official website. We agree wholeheartedly. Many experts have conducted studies on glutamine and they swear by its amazing post-workout benefits. If you think about it, so many post-workout supplements have glutamine – it just goes to show you how valuable it is. No wonder glutamine has been in use since the Golden Era of Bodybuilding. One look at those guys’ physiques, and you have an idea how well they took care of their bodies. Glutamine was one of the keys to their bodies’ growth and development. We’re not too excited about SizeSlim Recovery’s two grams of glutamine per serving, though. Many – far too many – post-workouts have around four or five grams per serving in a single scoop (like Jacked Factory POWERBUILD). It will take you two scoops to reach four grams with SizeSlim Recovery. That’s nice and all, but you’re using up more servings in doing so. On the other hand, this product has a post-workout ingredient which you don’t see everyday. We’re talking about 500 milligrams of L-alpha-hydroxyisocaproic acid or “HICA” per serving. This “is a metabolite of the amino acid leucine and may help to reduce acid buildup in the muscle cells allowing for longer periods of high-intensity activity before the muscle cell fatigues,” per SizeSlim’s website. Plus, “HICA also helps to neutralize waste products created during high-intensity exercise, helping to keep cellular mechanisms functioning optimally,” per the same source. 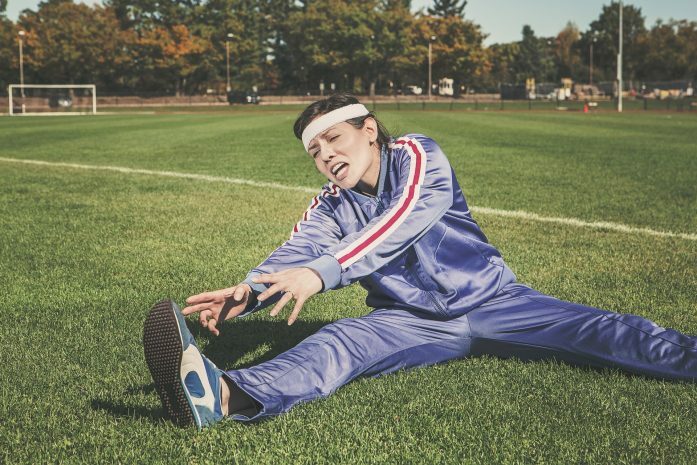 If you’ve ever felt a nasty, burning sensation after your training, you may have accumulated too much lactic acid in your system. HICA supplementation helps offset that. In fact, we believe you will be able to train harder and recover faster if it’s part of your post-workout arsenal. Not only that, but HICA supplementation also helps ward off delayed onset muscle soreness (DOMS). “In our pilot study with wrestlers, the findings with HICA suggested that it alone is highly effective on DOMS symptoms,” per the January 5, 2010 issue of the Journal of the International Society of Sports Nutrition (via NCBI.NLM.NIH.gov). With these in mind, it seems to us HICA is gaining traction as an important post-workout ingredient. We’re beyond pleased it’s in SizeSlim Recovery. We’re excited about the benefits you’ll reap from it. Aside from this product’s sheer simplicity, this product’s other selling point is its unbelievable ascorbic acid content – it has 500 milligrams per serving. That is equivalent to a whopping 1,111 percent of the daily value for Vitamin C.
It’s the most we’ve ever seen in a post-workout supplement. SizeSlim Recovery is far and away the most tremendous source of ascorbic acid for a recovery supplement. You can throw your Vitamin C supplement out the window when you purchase SizeSlim recovery – it will help strengthen your immune system and ward off the common cold for good. Plus, vitamin C is a powerful antioxidant. It also helps improve vision, regulate blood pressure levels, and boost heart health. The manufacturer’s website also says Vitamin C helps “reduce cortisol levels.” Cortisol is also known as the dreaded stress hormone – the higher your levels are, the lower your chances of building muscle mass. 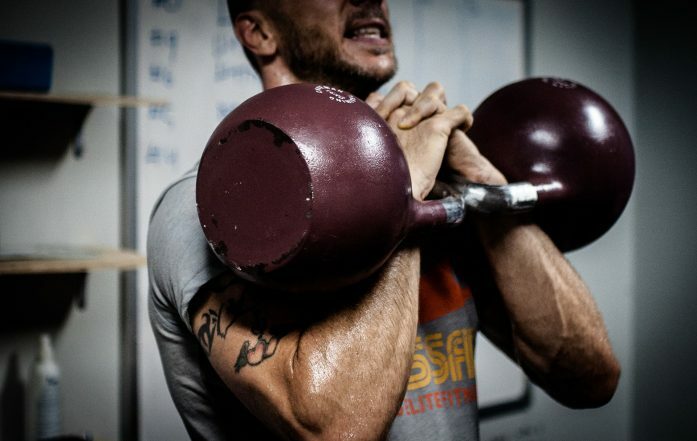 Look at the hard gainers out there – they have too much cortisol in their bodies. If they eat more, supplement with a powerful mass gainer and take SizeSlim Recovery to boot, they can kiss their hard gainer days goodbye. These are great benefits, make no mistake about it. However, Brazilian researchers caution against mega doses of vitamin C because there has been conflicting information regarding its benefits oxidative stress. Adequate levels (40 milligrams daily for men and 30 milligrams daily for women) would suffice. SizeSlim Recovery’s vitamin C levels are similar to those of big-name multivitamins. If you’re iffy about this, make sure to consult your doctor before buying this product. This supplement is a solid source of magnesium at 48 percent of the daily value. Bear in mind this mineral helps increase energy levels, improve sleep quality, boost digestive and cardiovascular health, ramp up testosterone levels, and ward off post-exercise muscular discomfort. Magnesium is a bona fide superstar supplement ingredient. We’re stoked it’s in SizeSlim Recovery. We also like this product’s low sodium amount – its three percent of the daily value is safe to take even for those who are monitoring their salt intake. Yes, you need to replenish with sodium to prevent muscle cramping. However, too many post-workout supplements go overboard. This one doesn’t. Finally, SizeSlim Recovery’s potassium content isn’t very high at two percent of the daily value. If you need more potassium, try consuming a different post-workout supplement instead. Vitamin C (as ascorbic acid), 500 mg: You won’t find any post-workout with this much ascorbic acid per serving. SizeSlim Recovery’s vitamin C content represents a whopping 1,111 percent of the daily value. Like we said, you won’t be needing that Vitamin C supplement anymore. Aside from the benefits we mentioned, ascorbic acid also helps regulate blood pressure and blood sugar levels, boost heart health, and improve eyesight. It’s that invaluable. Magnesium (as magnesium aspartate), 200 mg: SizeSlim Recovery is a solid source of magnesium at 48 percent of the daily value. This mineral helps increase energy and testosterone levels, improve digestion, boost heart health, and regulate calcium and potassium levels. Sodium (as sodium chloride), 60 mg: This much represents a measly three percent of the daily value for sodium, which is safe for those who are monitoring their salt intake. Potassium (as potassium citrate), 100 mg: This product is not a significant source of potassium at a paltry two percent of the daily value. Branch-chained amino acids, 4 g (leucine, isoleucine, valine): To put things in perspective, some post-workout supplements have five grams of leucine alone per serving. SizeSlim Recovery’s 5:1:1 BCAA ratio sounds too good to be true at first, but don’t let that fool you – it’s decent, but plays second fiddle to other post-workouts. Nonetheless, BCAAs are a great asset to any post-workout routine – they help increase protein synthesis, repair muscle tissue, and ramp up endurance. L-glutamine, 2 g: This amino acid has far too many benefits (muscle preservation, increased human growth hormone levels, improved gut function, etc.). Two grams per serving is minuscule compared to those of many leading post-workout brands (such as Angry Supplements C.G. 15 Creatine + Glutamine Powder Unflavored 15000 Mg.’s insane 10 grams of glutamine per scoop). “HICA” amino acid (l-alpha-hydroxyisocaproic acid), 500 mg: Aside from SizeSlim Recovery’s enormous Vitamin C content, this ingredient is another selling point. HICA supplementation helps offset lactic acid buildup and delayed onset muscle soreness (DOMS). Expect shorter recovery time as a result. All we can say is SizeSlim Recovery is one simple post-workout supplement. That’s the best adjective which describes this product. Will it increase strength and muscle mass and ward off soreness, like the manufacturer pointed out? Yes, it could. However, some of its ingredients (particularly its isoleucine, valine, and l-glutamine components) fell short of expectations. Let’s start with the BCAA content. Four grams of branch-chained amino acids per serving is decent, but we felt the 500 milligrams each of isoleucine and valine could’ve been higher. Many competitors have five grams of leucine alone. That might be enough for competitors to look elsewhere. To each his own then. If you’re happy with four grams of BCAAs per serving, then so be it – that much can still help you build lean muscle mass. Three grams of leucine per serving should still go a long way. The glutamine content is also lackluster – one serving yields just two grams. Other products such as the aforementioned Jacked Factory POWERBUILD have more than twice the serving amount. Again, SizeSlim Recovery could’ve put in more. Let’s look at the bright side: at least the inclusion of the “HICA” amino acid ought to help offset the shortcomings of SizeSlim Recovery’s BCAA and glutamine content. Like we said, not too many post-workouts have this ingredient. Expect greater resistance against lactic acid buildup and delayed onset muscle soreness. Better take advantage of the opportunity. A decent post-workout supplement such as SizeSlim Recovery can go a long way. We also can’t get enough of SizeSlim Recovery’s tremendous Vitamin C content. We bet one of the things you remember from your grade school Science class is this vitamin’s health benefits. Well, you get a heap of them when you consume this supplement – no other post-workout comes close to its daily value of 1,111 percent. Bear in mind vitamin C is a powerful antioxidant. It also helps regulate blood pressure levels, boost heart health, and improve vision. It’s one vitamin which packs a tremendous wallop, we’re telling you. Another plus is SizeSlim Recovery’s magnesium content, which is 48 percent of the daily value (a daily value of at least 15 percent is high). This mineral has a lot of post-workout benefits (increased testosterone levels, optimal muscle and nerve function, better muscle relaxation and heart health, stronger bones, etc.). You will reap them for sure when you buy this product. We also laud the manufacturer for including stevia, a natural plant-based sweetener which helps regulate blood pressure and blood sugar levels. That was a great move. Far too many bodybuilding supplement manufacturers lace their products with artificial sweeteners such as sucralose (a.k.a. Splenda, which has ties to obesity). Not this one. What a relief. We also noticed the company used beta carotene for its food coloring. Many competitors use artificial ones such as FD&C Red No. 40, which is a no-no considering its link to carcinogens. Beta carotene is a precursor of retinol or Vitamin A. This vitamin is great for eye health. We’re pleased it’s in SizeSlim Recovery. Other good points: this product is low in sodium, has zero calories, and has exceptional transparency (The manufacturer lists all of the ingredient amounts). 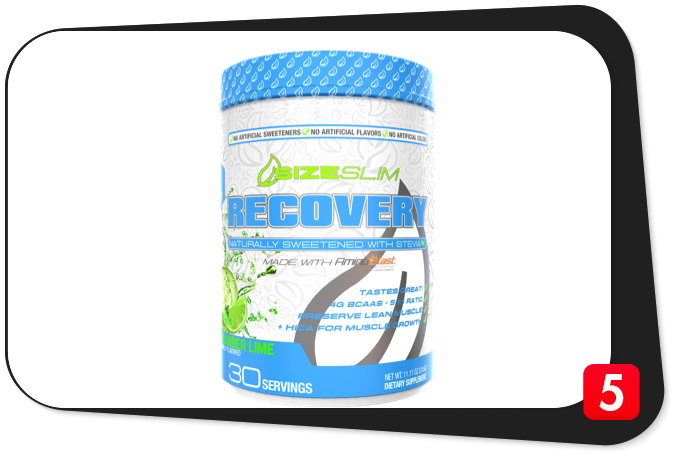 Customers have also been raving about SizeSlim Recovery. They swear by it. They also say it tastes great. We agree. This post-workout supplement is refreshing, to say the least. It’s one of the best we’ve ever tried. On the flip side, one downer is the inclusion of carrageenan, an additive which experts have linked to carcinogenicity and other side effects. The manufacturer should not have included it to begin with. Nevertheless, SizeSlim Recovery has more pros than cons. It has a great upside, make no mistake about it. It’s not the best post-workout supplement on the market, but it will make a difference. We agree with all of these claims. SizeSlim Recovery is a simple post-workout which can help you achieve your fitness goals and then some. The manufacturer intended SizeSlim Recovery for healthy and active individuals who are at least 18 years of age who want to build lean muscle mass, increase endurance, shorten recovery time, and achieve their daily fitness goals. SizeSlim Recovery contains carrageenan, an additive which experts have linked to certain side effects, including carcinogenicity. If this, or any other ingredient, makes you feel doubtful, please consult your physician before buying SizeSlim Recovery. Sweetened with stevia. Natural sweetener which helps regulate blood pressure and blood sugar levels. Simple ingredients. BCAAs, glutamine, and HICA amino acid. Has HICA amino acid. Helps reduce acid buildup, increase endurance, and ward off delayed onset muscle soreness. Features key electrolytes. Ascorbic acid and magnesium, to be precise. Incredible source of Vitamin C. Yields an ouststanding 1,111 percent of the daily value for ascorbic acid. Solid source of magnesium. Versatile mineral represents 48 percent of the DV in this product. Excellent transparency. Manufacturer reveals all of the ingredient amounts. Great reputation. Customers have given this post-workout high marks online. Flavor options. Comes in refreshing Cucumber Lime and Peach Mango varieties. Mediocre isoleucine, valine, and glutamine content. Could have been more, to say the least. Dirty ingredient. Has carrageenan, an additive which has several side effects. We had high hopes for Size Slim Recovery. Maybe we were just too excited about its stevia content. In a nutshell, this supplement has simple ingredients, has good transparency, and is a tremendous source of Vitamin C and magnesium. However we weren’t too impressed with the lackluster BCAA and glutamine content and the inclusion of carrageenan. The takeaway: SizeSlim Recovery isn’t bad at all. We recommend you try it. However, there are more powerful and cleaner post-workouts on the market worth considering.